It’s beginning to rain cherry tomatoes; the forecast predicts it will turn into a flood. Today I made an extremely low labor, nutritious dish that incorporates the beginning of this bounty. Basically all I did was roast salmon and cherry tomatoes together, then make a little sauce with the roasted tomatoes by tossing them with minced garlic, fresh basil and capers before serving. I squeezed lemon juice over the cooked salmon and served it over a bed of orzo tossed with olive oil and a tad of garlic. If I was serving this to guests, I might have brushed a little butter over the cooked salmon, for their added eating pleasure. Faster than fast food? Really. 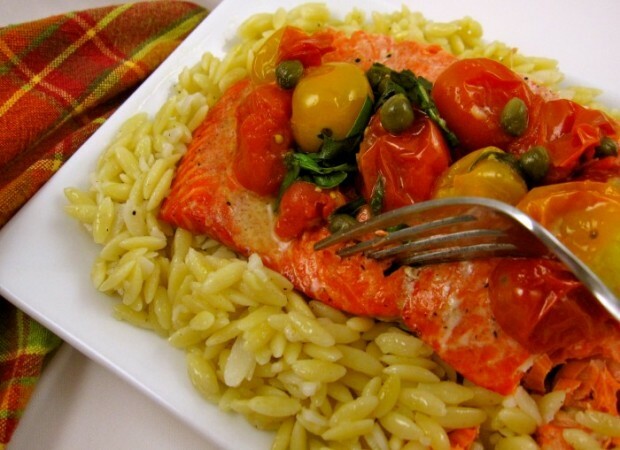 Line a baking sheet (large enough to fit the salmon and tomatoes) with lightly oiled foil. Place salmon on center of baking sheet and brush with 1 tablespoon olive oil; season with kosher salt and freshly ground pepper. Toss cherry tomatoes with remaining olive oil and lightly season with kosher salt. Arrange tomatoes in a single layer around salmon. On center rack of oven, roast salmon and tomatoes until salmon is cooked to desired level of doneness. You may check by pricking the center of the fillet with a fork. Squeeze lemon juice over baked salmon. Place roasted tomatoes in a small bowl and toss with capers, garlic and basil. Serve over salmon.